'Am I seeing things? I just checked my entry online and I think I know what you're about to tell me. 'I'm speechless. I can't believe it... I just finished work for the night,' he said. There was another winner of $23.3million in Hobart who is yet to claim their prize. If the man had only bought one ticket instead of two, the prize would have been halved between the two winners giving them $35million each. But because the man had bought two tickets, the prize was split in three with the man taking two thirds of the jackpot, or $46.6million. The man said he had been playing the same numbers for thirty years. 'I play every week. I have always marked my entries but I have never chosen the numbers on anything in particular. They weren't special before, but they are now,' he said. Talking about what to do next, the man said: 'I need time for the news to register. 'I might think about retiring. First maybe a new home or a holiday. 'What's remarkable about tonight's draw is that there were three division one entries, but two winners,' he said. On what the lucky winner plans to do as a multi-millionaire, Mr Hart said it sounded like he intended to leave his job. 'He may not have that motivation to work anymore. While the punter celebrates his once-in-a-lifetime win, the hunt is on for the third winning ticket holder - who will get the remaining $23.3 million. And according to Mr Hart, the holder of that winning ticket is from Tasmania - and they might not yet even know they've won. 'The other entry is an unregistered entry that was purchased at Hobart City Lotto,' Mr Hart said. The mammoth win comes after six weeks of the jackpot not turning up any winners - last Tuesday's draw reached a staggering $50 million. Though the seventh week proved to be a charm, with winning numbers: 12, 28, 24, 29, 9, 18 and 25 and supplementary numbers 13 and 31. 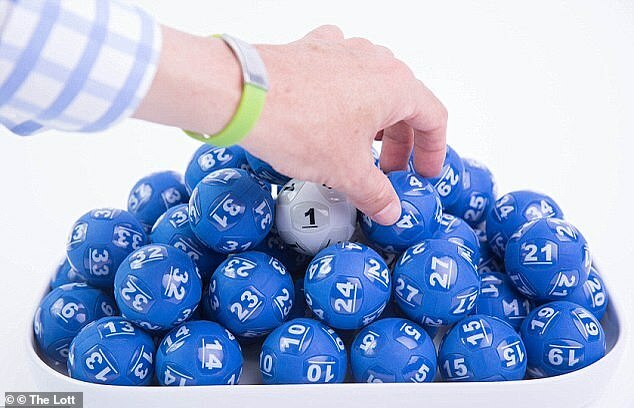 The $70 million prize stands as the game's biggest jackpot this year, and the third highest Australian lottery offer in 2019. Last year, 20 punters won the division one Oz Lotto and took home a total $253.7 million.